Dandenong is situated 31 km south-east of central Melbourne on the Gippsland railway and Princes Highway. The name is thought to be a corruption of an Aboriginal word meaning lofty mountains, and referred to the ranges 20 km north-west of Dandenong. The country is flat to undulating and was originally densely forested with red gum. The Dandenong Creek rises in the ranges and runs through Dandenong to Carrum on Port Phillip Bay. Joseph Hawdon established a pastoral run on Dandenong Creek in 1837, overlanding the cattle from Sydney. Soon a few timber cutters and a police camp were also located there. By 1850, the whole area had been taken up for grazing. Dandenong Creek was first bridged in 1840. A road was made from Melbourne, making Dandenong, by the late 1850s, an important staging post for travellers into Gippsland. It became known as the 'gateway to Gippsland'. A township was surveyed in 1852. Milling of the red gum timber became an important industry, and charcoal burning, tanning, quarrying and brick making also flourished. A stock market was established in 1866. The Western Port Aboriginal Protectorate Station was located north-east of Dandenong from 1840 to 1844. This area had been an important meeting and ceremonial site for Aboriginal tribes. The Native Police Corps established its headquarters there until its disbandment in 1852. The Police Paddocks were then used for breeding (hence, Stud Road) and resting police horses. By 1861, there were 40 houses in the township housing 193 people. A road board district was formed in 1865 and Dandenong Shire was proclaimed in 1873.The shire extended southwards from the township to Chelsea and taking in the future municipality of Springvale, in effect following the course of the Dandenong Creek to the coastal swamp land. Springvale remained part of the Dandenong Shire until 1955. 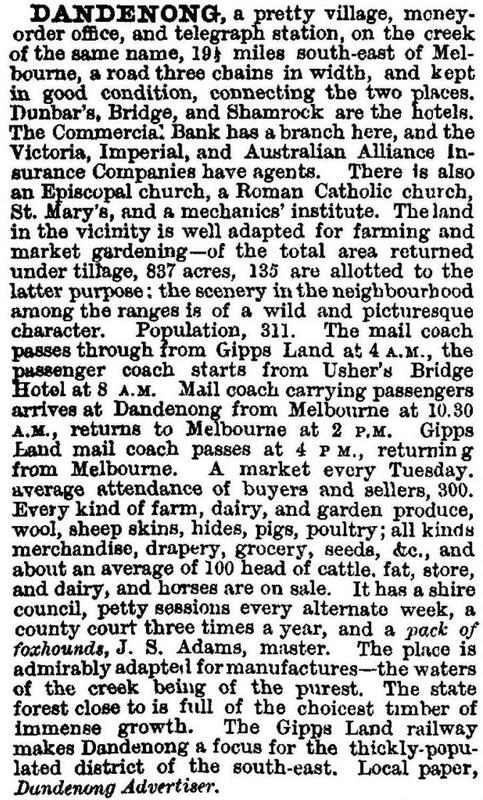 Presbyterian and Anglican churches opened in Dandenong in 1855, and the Anglicans conducted a primary school from 1855 until 1874, when a government primary school replaced it. The Anglican St James church was built in 1863. (The remark about the railway is premature, as the line from Oakleigh to Bunyip, passing through Dandenong, was not opened until 1877.) 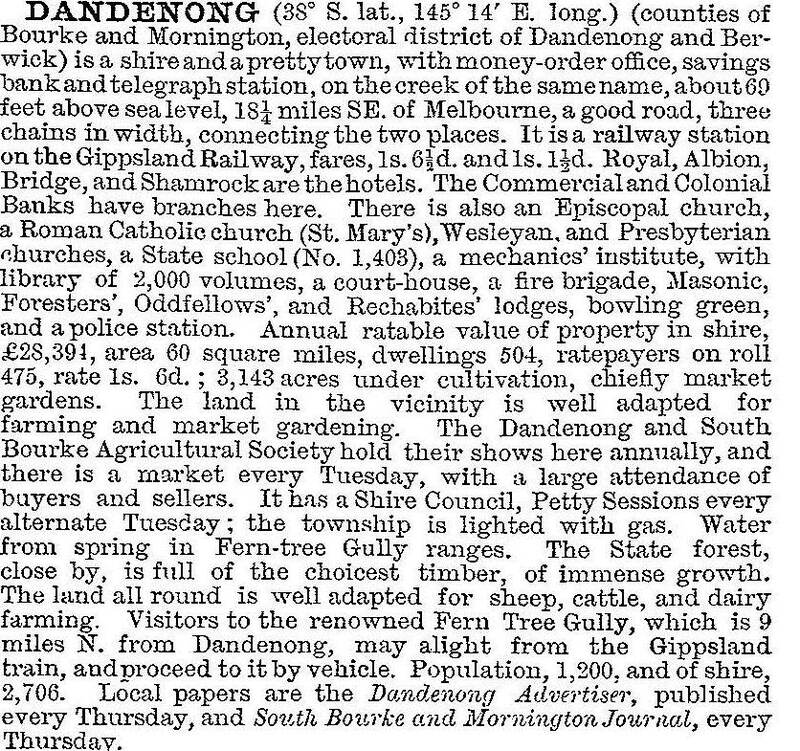 In 1888 Dandenong became the Great South Junction when the Great Southern Railway crossed the Koo Wee Rup Swamp to Tooradin, making Dandenong the railway entry to Gippsland. The term Gateway to Gippsland was thus realised. The cattle market became so large that a new site was needed. By 1959, the saleyards had moved to a location south of the town centre and the produce market expanded onto the old site. Each Tuesday, market day, brought hundreds of farmers and their families into the town. Although Dandenong already had some secondary industries such as Yarra Falls (1947), it retained a country town character until the advent of three large companies in the early 1950s. Heinz, International Harvester (1952) and General Motors Holden (1956) established factories on the flat land south-east of Dandenong. Many other firms, large and small, followed. The abundant new jobs attracted many workers, especially European migrants. The Housing Commission established the new suburb of Doveton, north of the Princes Highway in Berwick Shire, to house the rapidly increasing population. Industrialized Dandenong called for trades training, and a technical school opened in Cleeland Road, just north of the hospital, in 1954. Additional State primary schools were needed: Dandenong North (1954) and Dandenong South (1961). A girls' high school opened in 1957 (now Dandenong High middle school). Dandenong's local government was still a shire, including Springvale and Noble Park as far west as Dingley. In 1955 Springvale and Noble Park Shire were excised from Dandenong Shire, reducing it from 55 to 14 square miles. In 1959 the shire was proclaimed a city (see separate entry). By 1994, the Victorian municipal directory described a large retail and commercial centre that had been engulfed by the spread of the metropolitan area. Industry and manufacturing provide the main employment, with service industries becoming more important. Dandenong still retained some of its regional status, attracting shoppers from the country to its large retail complex. Regional police headquarters, Magistrates' Court, large hospital and associated services and TAFE college are located there. It is still at the centre of an extensive transport network, with a busy railway station and bus interchange. The cattle market closed in 1998. Although then one of the busiest markets in Victoria, it was located on prime real estate close to the centre of Dandenong. Central-area shopping was boosted in 1989 with the opening of Dandenong Plaza, which in 2011 had a department store, discount department stores and about 180 other outlets. Main street shopping subsided, and retail prosperity faltered when manufacturing industries closed. House prices flattened in the 1990s, making Dandenong affordable for new arrivals. In 1990 34.2% of the population were born overseas in non-English speaking countries, and 9.7% were born in overseas English speaking countries. As the new century opened it was possible to speak of 'Little India' eateries around Foster Street and the 'Afghan Bazaar'. This was additional to Dandenong's postwar multi-cultural history, visible with a Lutheran church (1962), the first of four Orthodox churches in 1959 and a Polish Seventh Day Adventist church, among others. Dandenong has a popular Arts Festival. An historical precinct is centred on heritage-listed and significant buildings between McCrae and Langhorne Streets. Part of the Police Paddocks had been incorporated into Churchill National Park. An obelisk and bronze plaque mark the site of the old barracks. The Dandenong Creek flanks the eastern and southern sides of Dandenong, and is joined by the Yarraman Creek which defines Dandenong's western boundary The streams have extensive linear parks, particularly well appointed where Dandenong Creek approaches the city centre. Note: After 1947 population data only published for shire/city.